In the early days of the League, the only source of income was from benefit games. One such game was played at Seaham Harbour on April 22nd, 1893. A Representative team of League officials turned out against the League Referees. Before the match the East End Brass Band headed a parade around the streets of the village. A large crowd gathered for the game, including a great number of ladies. The Referees were dressed for the occasion in female costume. The carnival atmosphere was maintained with the band playing during the game. The Representative side won the game 5-4, but the score was academic. 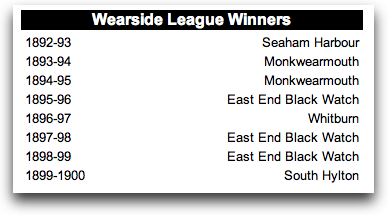 The Wearside League Rules of 1894-95 season, stated: "The League will play two benefit matches, one on Christmas Day and the other on Good Friday, and no League club to play any match on those dates. Some of the original members of the Wearside League had unusual origins. For example, East End Black Watch was formed with the sole purpose to assist a brass band. A number of men from the East End of Sunderland had the idea of forming a brass band and this was achieved in 1887. Many of the East End Prize Band were paying members but did not play instruments, they did, however, play football. The officials knew that by keeping the men together their interest in the band would be maintained. Therefore, they helped them form a football club: East End Black Watch. The title Black Watch did not have a local connection, a committee man thought "the name would encourage the players to succeed as had the famous Highland regiment." On April 19th, 1893 a game was played on the Town Moor between Black Watch and the East End Brass Band, with the referee in Chinese costume. A collection was taken during the match for the benefit of the band. Black Watch soon found success in the Wearside League, winning the championship in 1895-96 and then a further two titles in 1897-98 and 1898-99 seasons followed. Victories were also gained in the Monkwearmouth Charity Cup, Black Watch won the trophy four times before the end of the century. Another of the successful early clubs, Royal Rovers, had the most humble of beginnings. The club was formed in 1884 and had at first to play on the sands behind the cattle sheds in Sunderland Docks. The club took its name from the Royal Hotel, which was the house of the grandfather of one of its founders, Ralph Scott. The club survived on players' contributions, despite the fact that these only stretched as far as purchasing cheap india rubber balls. The club were fortunate that these only cost 4d each, as a number of balls were lost in the sea. From these the club progressed to a second-hand rugby ball. For the second season, the club acquired a better ground and proper ball. Although, while the players scraped together enough to buy an Association case they did not have enough for the bladder and the old rugby one had to do for the rest of the season. In 1890 W.T. Lazenby became involved with the club and took over as secretary. He remained in this post during the next 14 seasons during which time Royal Rovers won 4 championships, 3 Shipowners' Cups and 2 Monkwearmouth Charity Cups. 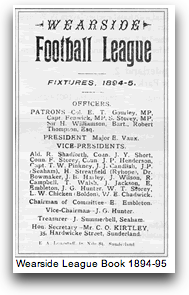 In 1906, Lazenby took over as chairman of the Wearside League, a post he was to serve until 1924-25 season. In 1906-07 Royal Rovers left the Wearside League for the North Eastern League, becoming known as Sunderland Rovers. In 1896-97 a club called Marsden Rescue were admitted to the Wearside League. They took their name from a sea rescue that took place off Marsden. This involved a father and daughter who went out in a rowing boat to save the lives of a number of seamen. On the football field they did not meet with much success, leaving the League after only one season.